The mid-game, where the routes are neither too long or too short! At this point in the game, the Player should have a couple HMs to overcome obstacles, and their Pokémon party should start being more and more fleshed out. The developer also has a variety options; they could start using different types of biomes, dungeon inclusion, and even puzzles. Truly, a trial with a focus on the mid-game has a lot of potential for all those participating! "If you're stuck for inspiration, check out routes from Hoenn and Sinnoh. They both have quite a lot of variety and could give you a couple ideas!" Notes: Oooh man, I had so much fun making this map! I wanted to do a more FRLG styled route while still staying true to my own style. My main sources of inspiration were Kanto Route 3 and Hoenn Routes 111 and 117. I went a made several screenshots of how I worked on this map, I hope you like it! Bonus question: In addition to the Item ball in the middle of the map, there are three more items hidden on the map! Can you find where? Critique Requested: I'd love critique! Notes: Mid-game is always when the game starts to get adventurous with what you're presented with, and so: the foot of a volcano. Better hope that video game convection is in effect, or those trees are gonna catch fire! To the south-west is the exit to Route 6, and to the north is the very foot of Mt. Screy, a dormant volcano - popular with hikers, people looking to train their fire-breathing skills against an impressive backdrop, and those looking to hone their skills in battle against the somewhat hardier Pokémon living here (such as Numel and Gurdurr). It's also a mandatory part of the Gym challenge, visited after your 4th badge. As such, the foot of the mountain is frequented by quite a variety of people; rather irritating to the local people who want to protect it for its religious significance. At this point in the game, you've probably got access to Rock Smash, hence the two items cheekily hiding behind some rocks on the map. 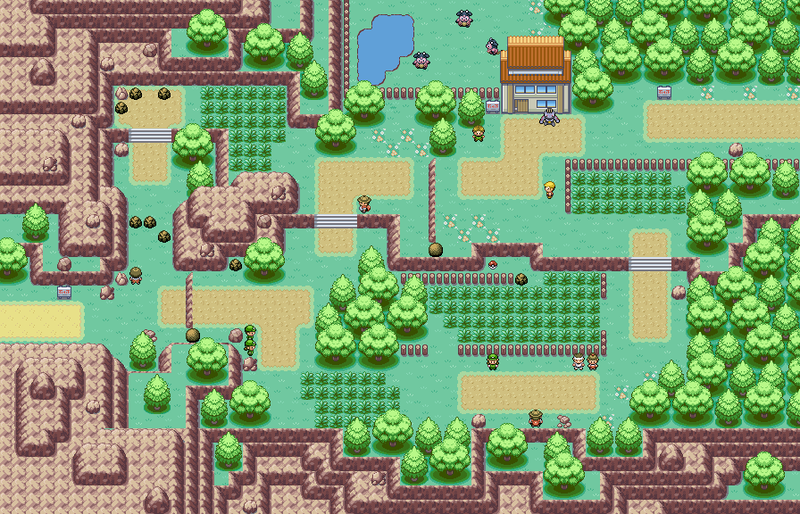 The layout is designed to put heavy emphasis on fighting the map's Trainers, with an easy route back down to access the nearest Pokémon Centre in the previous town if you end up beaten black and blue. Notable inspirations include Stark Mountain and White 2's Reversal Mountain, only one of which is actually midgame, but shh. Also, yes, I do like grey cliffs probably a bit too much for my own good! All tiles belong to Magiscarf. Overworld sprites are sourced from The Spriter's Resource. Notes: I personally felt that rather than focusing on some sort of puzzle, I would focus on an aesthetic that I personally really enjoy. I love the colors and fallen leaves of the Autumn season and wanted to incorporate that with a mixture of modern (the train station) and traditional (the tower and the bell). I tried to make it as visually appealing as I could with what I wanted to do and I hope that you all enjoy it! Notes: The player enters the map from the left and has to cross the river to continue their journey. Unfortunately, the fastest way across is blocked by a sleeping Snorlax and a sleeping old man, so the player has to take the long way around, where they will face many wild Pokémon and trainers who are eager to battle. 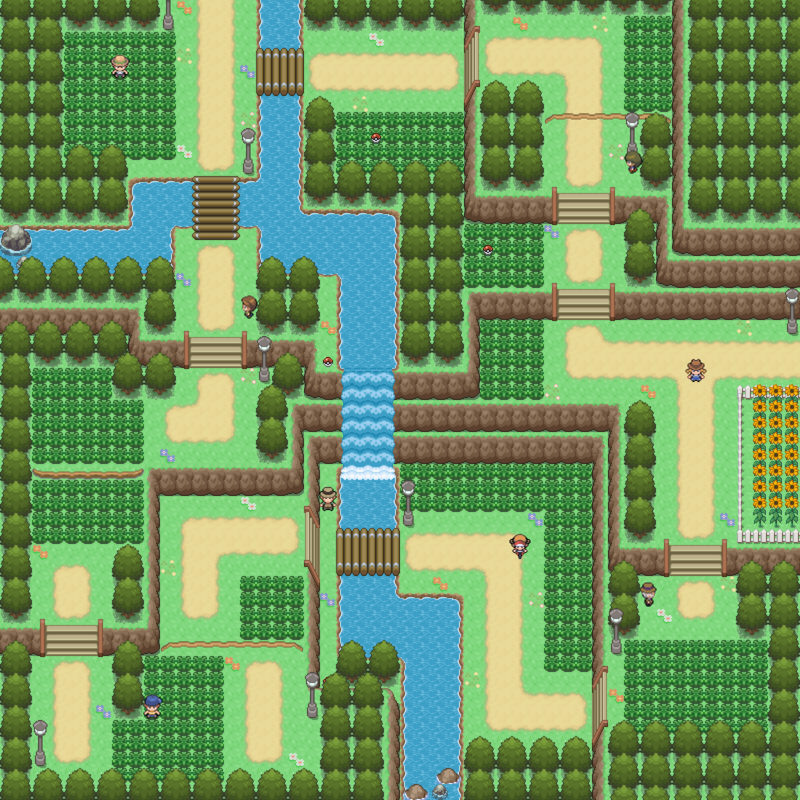 If the player returns to this route with the Pokéflute, they can not only battle and catch Snorlax, but in doing so also open up a very useful shortcut for the next time they have to cross the river. There is also a mysterious cave on an island in the middle of the river, which can only be accessed by using HMs Cut, Surf and Strength. According to the old lady on the island, a legendary Pokémon lives deep inside the cave. But is the player ready to face such a challenge? This is only the mid-game after all. Notes: (I'm sorry if this ends up sounding like a load of garbage, I'm writing this at 1 a.m.). 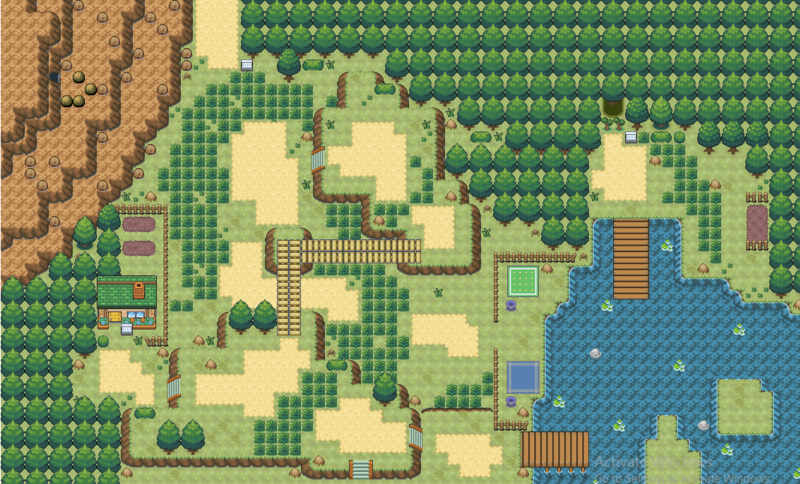 When I think of mid-game routes, an area in the game that I fondly remember traveling through was that of the Valor Lakefront in Pokemon Platinum. Therefore, I clearly took inspiration for this map from this area. Upon entering from the top-left of the map, the player is faced with multiple paths to traverse the route: they can take the shorter path by scaling the mountainside or travel through the villas where they will arrive at the beach. What I aimed to do here was allow the player to chose whether they wanted to take the long way through or give them the ability for quicker travel, opening up the area for exploration at one's own leisure. This route has a very moist climate. A big variety of bug Pokémon calls this swamp their home. Therefore this swamp is popular for bug catchers, who want to catch rare bugs. The north of the route has a clearing which harbours a hill with a spring which waters a lake. Because of nobody but bugcatchers wanting to go through that bug-swarmed forest the Pokémon in the lake aren't disturbed by tourists and the Water Pokémon have enough food and can develop better than in most other places. So the lake is a popular spot for fishermen. But due to the wild environment only the most dedicated fishermen make it to the lake. Man, did I feel bad I could not compete in the previous Iron Mapper due to a busy schedule. Luckily, I managed to fit this trial into my schedule, so I'm really happy I finished it on time! 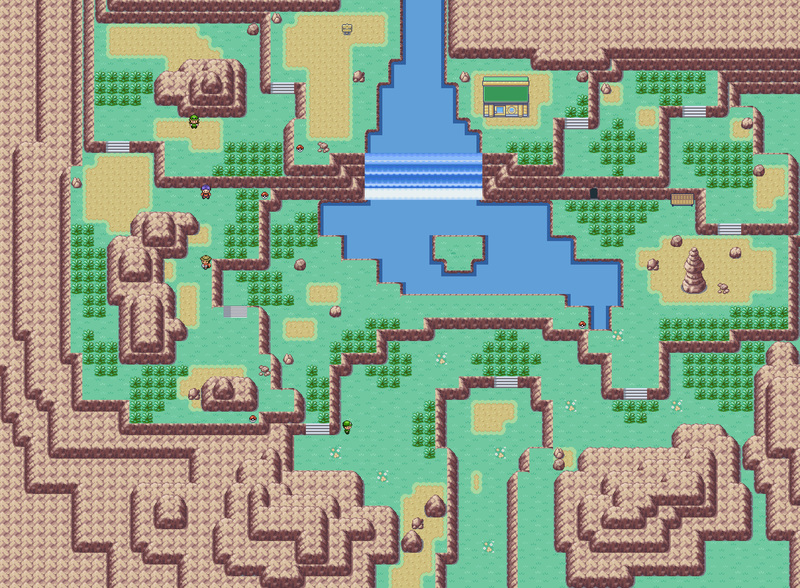 Now about the map, it's a mountainous route with a river flowing through it. However, the river was not always like this. In the past, the river flowed in just some different positions than it does now, creating "trenches" in the ground due to the erosion caused by the river. 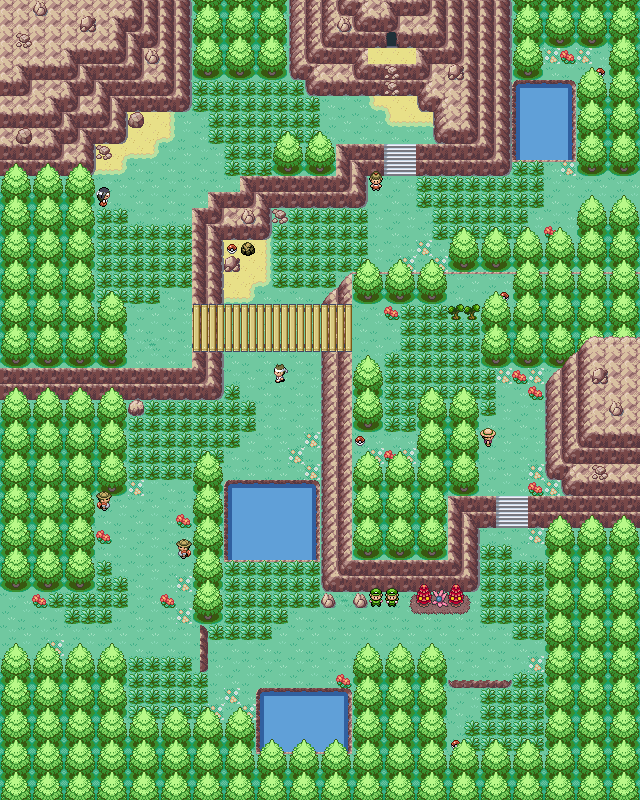 This route is meant to be traversed between the 4th and the 5th gym. This is the moment your journey gets serious and it can be seen in the battle opponents. Numerous Ace Trainers make this route their training grounds. The map will be entered from the left side and the first time the player goes through, he/she should only have strength from the used HMs on this route. The gameplay is also a bit special here, due to the way the strength boulders work. There are 3 strength boulders on top of a cliff. When these are pushed, they will tumble down in the trench. When there is a strength boulder in a trench, the player is allowed to jump on it, so he/she can move over the trench. 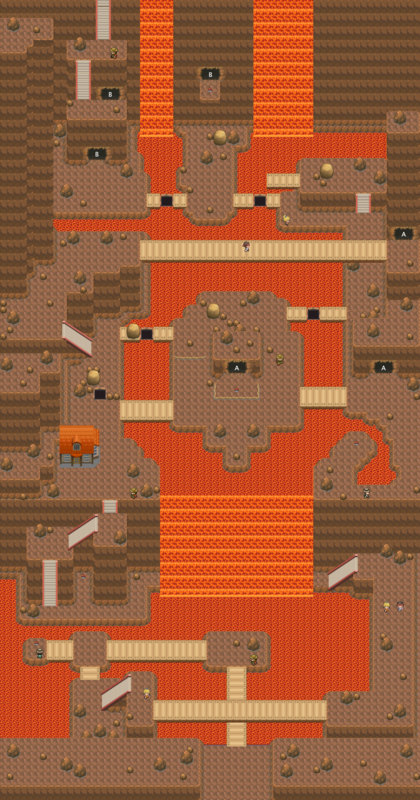 Due to the design of this route, the first time the player traversed through themap, he/she has to explore a bit of the upper part of the map to push the first 2 boulders from the left down. The third can be pushed at a later stage of the game to access a good TM. With these boulders pushed down, the path to the next city is quite linear and easy to traverse for the player. This creates some easy backtracking. Also, I forgot to mention that these strength boulders will always stay in the trenches when pushed down, so it has to be done only once. 120 x 77... so it may be fairly large for a mid-game route. I tend to make bigger maps, however, so I'm content with the size. Plus, a lot of it is scenery that the player can't even see. The player starts out at top right after exiting the cave. By this point, they will have access to Rock Smash, but not Strength and Surf. They must find their way down the mountain, fighting a variety of trainers along the way. In addition, there are a couple of exploratory areas that the player may choose to venture to along the way, or return with the aid of more HMs. I wanted to allow the player to traverse the route without any HMs, but still incorporate them in some way. For example, some items can only be obtained using certain HMs, and I added a fast path back through the route (the bridges) once the player acquires Surf. The first southern exit (towards the middle of the map) leads to a crater (a side location). The western exit leads to Vráchos town, while the other southern exit leads to Route 13. Also I'm not familiar with the super technical details with when to use some tiles over others. Entrance from the top left. You can see a mountain in the top left corner which exit is on the previous route. A part of the mountain is visible in this a route too. The player acess the mountain from the previous route and must have HM strength to enter (which u dont get till now). There lives a berry farmer on the house who will inform u that he sometimes hear high pitch cry of a particular pokemon when is works on his little farm in his backyard. 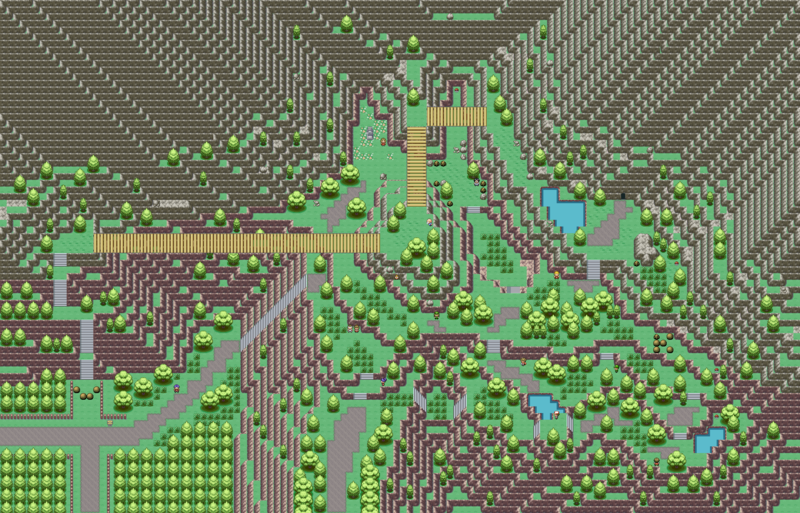 There is also a exit of a forest from top right which is near route 2. But u cant access this route from that forest because you need HM surf which you didn't have then but have now. Also you can see clothes lying on the ground besides the water which are of fisherman's. they gather around here because its a good spot for fishing. There are 2 exits from this route - on right and towards buttom. Critique Requested: Yes, please and thank you! Notes: Who says linear has to be boring? When I hear people talk about good route/level design, non-linearity often comes up. But I think that with a winding path and interesting puzzle challenges, a linear route can often be more fun than an open ended level! I implemented these into my route design through connecting caves, bridges, and strength puzzles. 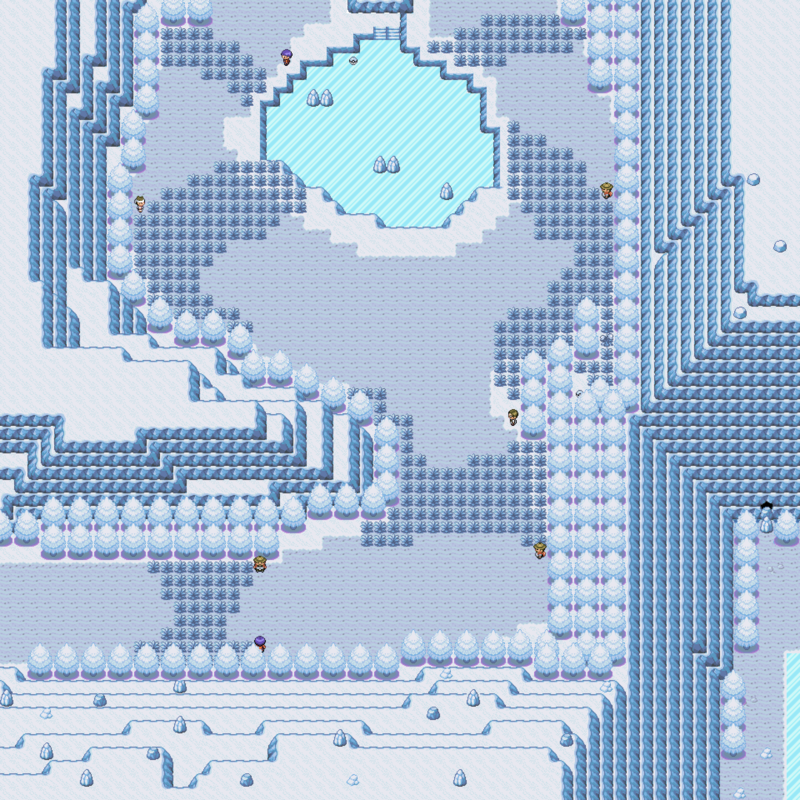 As for the map’s aesthetic, when I saw that the challenge was making a mid-game route I immediately thought of Hoenn’s Mt. Chimney and its long, linear Route 119. That inspiration is pretty obvious looking at the final result. The player starts at the bottom and makes their way upwards towards the summit of the volcano, where I imagine they will confront the evil team about their plans for the second or third – but not final – time. Perhaps they have taken over a geothermal power plant at the volcano’s crater? 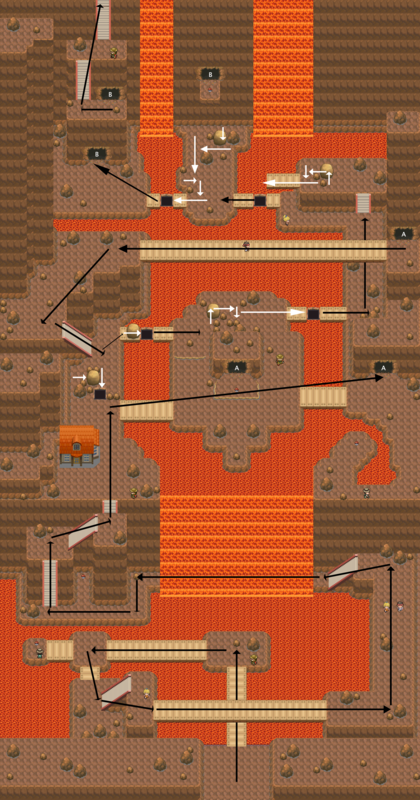 After passing behind a lavafall, the player will encounter a rest house before continuing on to a series of connecting cave systems and bridges (a strength puzzle that can only be solved from the other side will allow a shortcut to return to this rest house later on). This environment didn’t feel right for including tall grass, so I figured the caves would be good ways to have players encounter wild Pokémon when traversing this route. Some of the caves have optional exits that lead to items. Finally, there are holes in some of the bridges that can be filled in with the strength boulders and walked over. I made sure that the first one of these was very simple and obvious so players would understand this was a mechanic. Overall I really enjoyed making this map – it’s quite different both graphically and aesthetically from anything I’ve done before and I think it turned out well! Critique requested : Yes, please ! 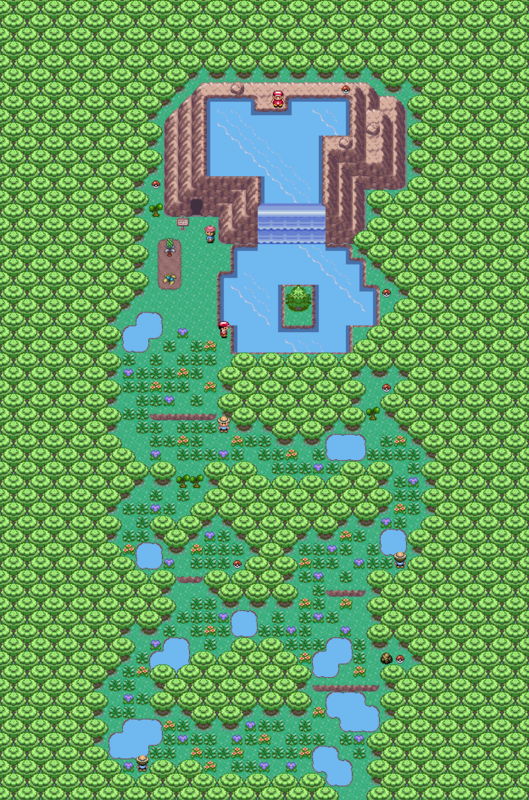 Notes : After entering and doing his stuff in Magnolia and its beautiful flowers, the home town of the 4th gym, the player goes down from the top left onto Route 14, named Magnolia meadows after the nearby city. This route is pretty usual : 8 trainers, some items to collect, and a pretty wide variety of wild pokemons. The player will follow the route's path, going down then to the river, then up again, to finally reach the well known Magnolia ranch. I, for this trial, thought that making another really wide and long Route would not do it, but i didn't want to make a puzzly one, so i went for a more classical approach : a pretty straight forward route, not too big, not too small, that isn't a linear, but not to puzzly. I really did enjoy making this map. 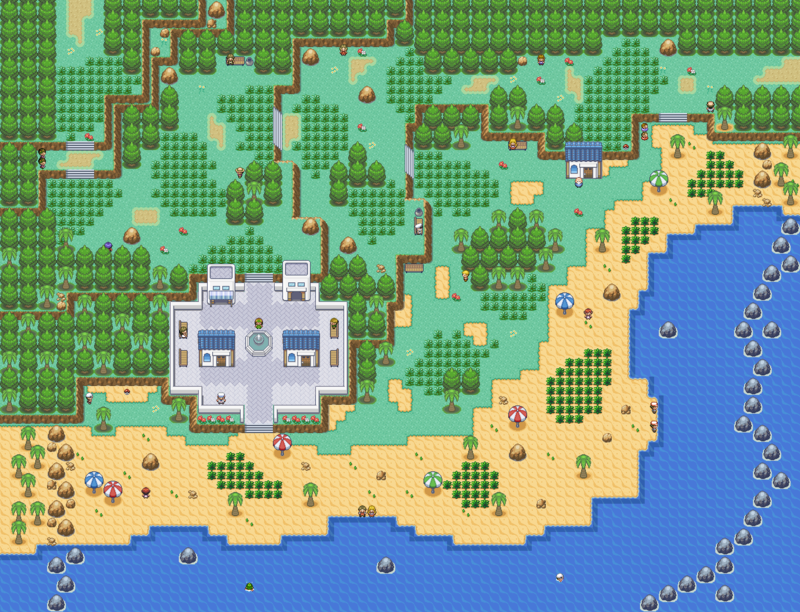 I had a little problem with my map capture script, which made the trainers and items appear on top of the grass, but no worries, this is not the case in the actual map. 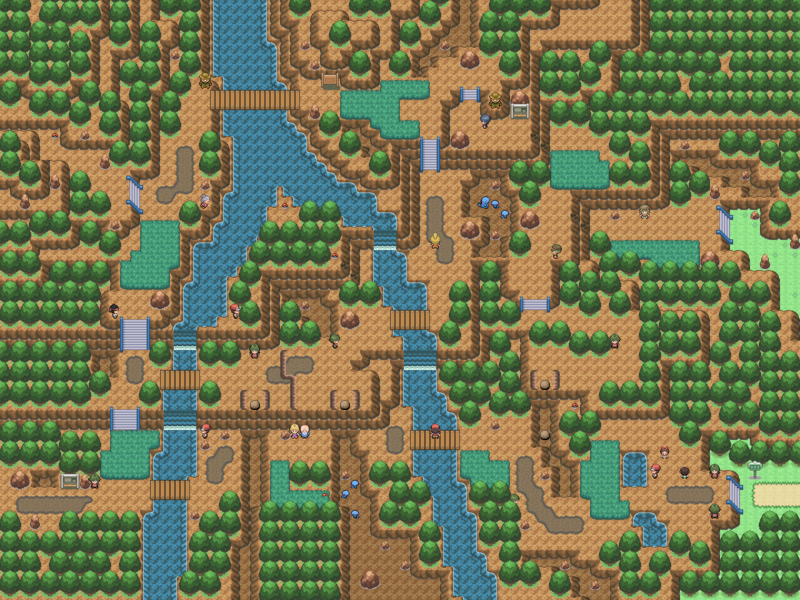 Notes: I rushed a lot in order to get this map done, and please ignore the trainers that look like they're standing on the water (it makes no sense). Just know that there are trainers there. Inspiration came to me from the FRLG Diglett's Cave music (it was stuck in my head) and I also had wanted to do something with bridges. After defeating the 4th gym in Noxious Town and obtaining the HM Surf, you progress through the Dead Swamp. It's full of toxic water you'll need to surf and navigate through. Be on your guard, as you never know what angry poison-types will jump out at you. I would also try to get through those weeds (not hay!) as quickly as possible, as the creatures living within them won't be happy you're disturbing them. There are also Bushwackers, Explorers, and Black Belts looking for a fight, and there's even some child swimmers (they probably shouldn't be here)! You might find an odd potion or antidote as well to help you get through. If you and your team works hard, you might even survive! This is Belmont Passage which leads up to Belmont Summit. You start from the base of the mountain and make your way upwards as the landscape transforms from a prominently green one to more of a rocky and brown one. It is a popular trail for hikers and rangers. An old man has built his own home on the mountain, he welcomes visitors and is even willing to teach a few special moves to trainers if they want. There is also an entrance to a cave on the side of the mountain, not many people go into it though because no one really knows if it leads anywhere. Routes are always fun, aren't they? One of my favorite things about running Iron Mapper is seeing the creativity and different ideas everyone has, and I think this really shines through on things like dungeons and routes. And of course, any opportunity to encourage everyone to include HMs in their maps is a welcome one! With VanillaSunshine's map, you have a short but sweet route that offers two ways to traverse the map -- and no matter which way you take, you'll catch a glimpse of the other area. On Streetie's map, a creative map involving rivers comes to life. The boulders on this map are a very nice touch that require the player to explore the map, which is always a good thing. Kudos to both VanillaSunshine and Streetie! - This map is rather large and could be tightened up in a lot of places. - The patches of tall grass are rather large. - With the map being so open and empty, it feels like the map doesn't have a lot of shape to it other than the mountains. - It feels strange having one row of trees against the entire mountainside. - There's a strange pink outline on your trees' shadows. - Assuming the puddle by the ranch is a result of rain water, it's strange that it's the only puddle on the map, especially considering the varied elevation. - There's a few tile errors involving the mountains, notably in the bottom left corner. - The path by the ranch feels more like two paths conjoined together rather than one path. - Even though it is a video game and your description did poke fun at it, having trees that close to lava unburnt doesn't make a lot of sense. - The map layout itself is pretty solid, although it feels like a bit of a wasted opportunity not having it a bit bigger. - A minor nitpick but the tall grass on the mountain area is a bit strange. Is that supposed to be soot? Considering the tall grass below the mountain isn't very far away, wouldn't it make sense for those patches to have some as well? - This map is... unnecessarily big. Even if there was some sort of big event here, this map is far too large for what's in it. - The lack of roads and size of the map also makes the map feel a little directionless. If the Player entered from the east or west, their only indicator of where to go would be to follow the river. - The darker autumn leaves are a bit of a mystery there. I would have first thought they're a border block, but you have a hidden item on it. Unless that's only accessible by surfing along the river? In that case, I'd advise against including a hidden item on something the player is taught to be untraversable. And if that is a border with the leaves, that's a pretty weak border. Why are some leaves stopping the player from traversing there? - The placement of objects in this map feels off. The tall grass is arranged very oddly and snakes around the map -- which means it comes across more as a map filler than something the player has to worry about traversing. The apricorn trees are immediately right next to a rail station. You have lanterns that are along the coast of the river on one side, yet on the other side where there's more buildings they aren't there. The well and the bell are shoved aside to be in the border when they could have been featured by the other buildings. There's only one little bit of land/object in the river. Think about what you're wanting to accomplish when you place some of this stuff down in a map, at the moment it just feels like it's meant to fill in the map rather than be an interesting aspect of the map. - There's some tile oddities; the fences aren't connecting properly. One of the trees in the north-east of the map doesn't have a stump. A tree above the gatehouse doesn't have the proper tile underneath it. - This map feels rather large and could be condensed and tightened up in a lot of places. - Some of the tall grass patches are small and unnecessary. They don't really add anything and look like they're just there to fill the map. They don't seem to be for convenience either; if the Player is looking for tall grass they're not going to have any trouble finding any. - It feels like a missed opportunity not having a lower elevation area along the coast of the river, or at the island in the middle considering there's stairs in both spots. Definitely not a requirement to have a good map, though. - This map generally is a bit spread thin. If you tightened up the top part of the map and the beach area a bit, this could easily be an incredible map. - Minor nitpicks: the tall grass on the beach could do well with a palette change, perhaps some more objects in the water? Some of the grass patches are a little large. - The ledges feel a bit odd on this map. It could easily go without them and not lose much. - Map feels a bit too cramped. The diagonal trees don't help with that as they would make traversing such small spaces a pain in game. - The tall grass sure is, well, everywhere on this map. While it is supposed to be a sort of "wild" swamp/forest, having some stretches without the tall grass would go a long way in the bottom half of the map. The puddles just don't feel like enough. - The traversable mountain tile definitely feels repetitive on this map. Mixing it up slightly and making sure it's not the same tile as unreachable mountain areas would be desirable. - Minor nitpick: the shadow on the trees are green, which looks off. - The strength boulders are a very clever idea! - The bottom left corner area of the map is rather plain, and could use a few more details. - There's a handful of tile errors with the mountains. While you likely used the mountain-on-grass tiles to convey that they're on grass, if they're layered on a mountain it does look cleaner to use the proper tile for it. - The "indented ground" by the old man and in a few other places are used for hidden items in gen 3; it might be confusing to use it as decoration. - The map feels too claustrophobic in various areas and could be opened up a tiny bit more. - The trees in the bottom left of the map don't utilize any shadows. - It's generally advisable to use a different tile for walkable mountain tiles versus inaccessible mountain tiles. - This map does need something to break up the rather repetitive tiles. That's a little difficult with a mountain, though. - There's honestly not a lot of objects on this map; it could use some more. Rocks are alright when used in moderation, but this map lacks that extra bit of visual oomph. - The jumpable ledges feel a little out of place, they're only used in one area. Incorporating them into more of the map might have been interesting. - The lamp posts feel a bit out of place in a route. It's more understandable if they're near the entrance/exit of a city, but the ones in the bottom left are definitely a bit suspect. - The water area feels rather dull, perhaps some rocks or something could break up the monotony of it. - The mountain area is a little bit cramped and could be a little bit more open. - The swamp itself feels a bit empty in a couple places? Having a log or something wouldn't go amiss. Swamps are a pretty good place for extra objects and details. - The tall grass placement is a bit odd in a couple places on this map. The small patches could be beefed up a little bit. - The dirt feels strange, notably in the square blotches around the top right corner. Making the dirt sections bigger wouldn't go amiss! - There's some tile errors with the mountains in the bottom left traversable areas. This map was not considered for judging as it was a late entry. Notes: It might look a little plain but i think it works. simple long forest route with a few trainers. - The large tall grass area could be broken up a bit more with some empty spaces or maybe even trees/rocks. - A handful of tile errors for the southern water-land borders. - Trees lack utilization of shadows. - The mountains by the gatehouses have various tile errors and don't use the proper no-shadow version when stacked on other mountains. The mountains by the east gatehouse don't all use the proper shadowed version when on the grass either. - The random very tall grass patches are a bit out of place and don't seem to add much to the map. - Overall, it does feel a bit plain and could be spiced up.